In recent months, I have been more excited by launches in the Free From food market rather than skincare. Some of the products which I buy from independent stores have launched into the major supermarkets, for instance, Pudology in Tesco and Rebel Kitchen in Waitrose. I have been loving the Tesco Lifestyle Fair and my most recent purchases are pictured above. Earth Balance Cheddar (Vegan) popcorn is a bit of a life changer as mainstream popcorn (aside from salty) often contains milk. I freaking love the PB Pops (peanut butter popcorn), dangerous stuff, you can't stop shoveling these into your mouth once the packet is opened. Udi's is hit or miss when it comes to dairy and egg free products, their focus is gluten free. I'm sorry to say the cereal bars are a big let down for me. They break apart in your hand and are not a satisfying texture in my mouth. I was hoping for something similar to a Harvest Cheweee. The Amisa mayonnaise is, how should I word this, interesting? The consistency is reminiscent of the real deal but I'm not too sure about the taste. It's not horrid just different to what I am used to. I normally buy Tiger Tiger Garlic May-O from Sainsbury's. Several Enjoy Life Rice Milk Crunch chocolate bars have found their way into my trolley each week. I don't think it would ever replace my Humdinger buttons but certainly makes a nice change. I think it has a good "milky" flavour which can be hard to find as often dairy free chocolate fails to satisfy my taste buds. Curiosity got the better of me with Blue Diamond Almond Breeze Mocha and Cappuccino drinks. I am not a coffee drinker and until recently would not let it pass my lips but for some strange reason I'll happily drink Vivesoy Cappuccino. Sadly, I did not like either Blue Diamond Iced Coffee. I found them watery and I couldn't handle the after taste. In comparison, I find Vivesoy creamy and the coffee taste is subtle. Another fail on my taste buds are Oko Bay coconut water ice lolly. Weirdest flavour I have ever tasted and in the future I will stick to Smooze. Meridian bars also fell short for me and I haven't repurchased. I am still sitting on the fence when it comes to Co Yo (now available at Tesco) and The Coconut Collaborative (Waitrose). I am not sure they are suited to my taste buds after many years of eating Alpro yoghurts. I enjoy a couple of spoonfuls but then feel they are too rich for my stomach. It's a huge step in my eyes to find all these products in supermarkets. The problem is now I face a huge sense of guilt for not shopping at my independent organic store. The difference is I am not making a 34 mile round trip car journey. Have any of you tried the products I have mentioned? Whilst we are on the topic of free from food, check out my guest post for Bodhi Luxe featuring my favourite luxury treats. 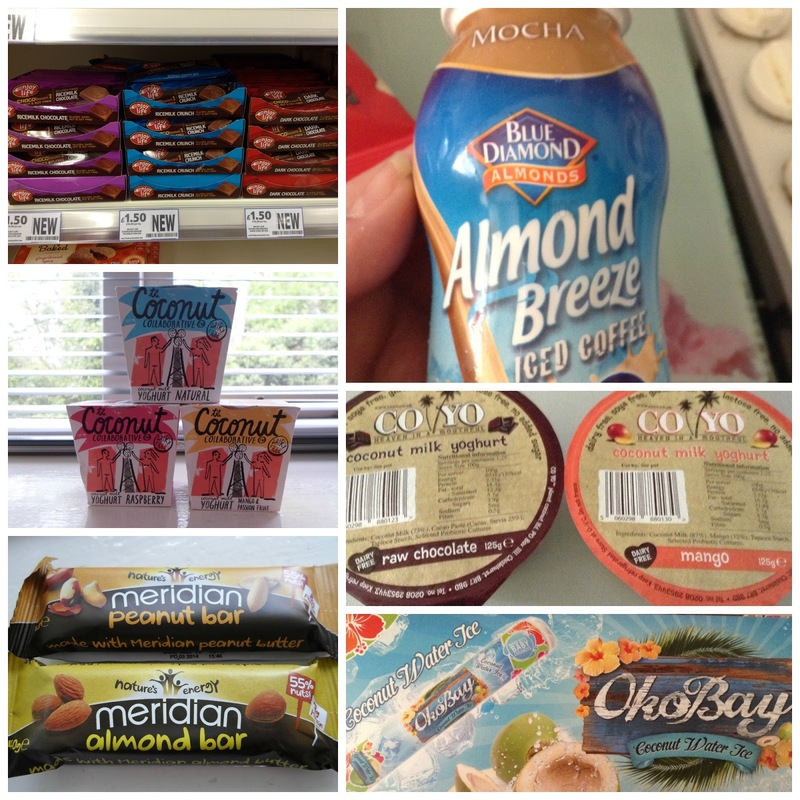 Disclaimer - The Coconut Collaborative yoghurts were sent to me, everything else featured here was bought by me. No affiliated links.